A trip to a theme park can be costly, not only are there car parking fees, drinks, snacks, and souvenirs, there’s the actual cost of getting into the theme park too! 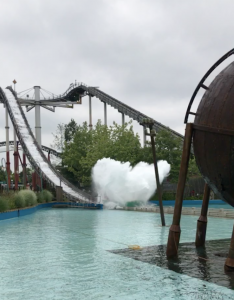 Save money by taking advantage of special offers (such as the Alton Towers PAY FOR A DAY, COME BACK ALL SEASON FOR FREE deal), as well as money off vouchers in newspapers, online and on the back of cereal boxes! http://www.hotukdeals.com/ often contains money off deals, so be sure to regularly check! 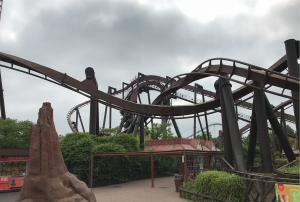 A Merlin Annual Pass is also a great way to save money, and offers admission to Alton Towers, Thorpe Park, Chessington, Legoland, and Madame Tussauds, and more! The yearly cost varies, but generally, if you go to more than 3 or 4 attractions per year, it works out cheaper, plus simply by having a Merlin Annual Pass you get discount on food, drink and souvenirs! Take advantage of dinks refills, and meal deals whilst in the theme parks or attractions, as these can also save money. Most parks also allow you to take in your own food and drink too, and most also have their own picnic areas for you to enjoy too! You’ve probably paid a lot of money to be in the theme park, so you’ll want to get as much out of it as you can. Arrive early, and stay late. When you arrive early head straight to the back of the park, or the major rides first. 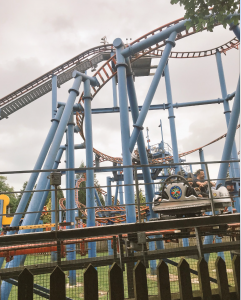 The back of the park is generally quitter at the beginning so you’ll be able to fit in more rides, plus if you arrive early, you’ll be able to get on the bigger rides without too much of a queue. Plan your route for the day and create a list of rides you want to go on, most theme parks have apps that you can download that show maps, and can create schedules for your day – use them to get more out of your day! Many parks have staggered opening times, so the park will open at 10am for example, but some rides won’t open until 11am or 12pm – this might seem annoying at first, but use this to your benefit. 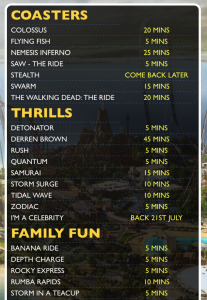 If the park opens at 10, there’s probably not going to be anyone queuing for an 11am opening ride until a few minutes before it opens. Squeeze in as much as you can, and be the first in each opening queue. Similar to the above really. Most parks advertise a closing time, at this closing time it doesn’t mean the park closes, but the time is actually the last time you are able to enter a queue. So if the closing time is 4pm, you are able to join a queue right up until 4pm, you can stay in this queue for as long as it takes and ride the ride. The park will only close once the queues are all gone. Being prepared can help you get the most from your day. Take a waterproof jacket with you for the water rides and rain, and a pair of flip flops will help you when you visit a water ride. 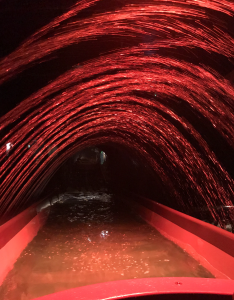 If it does rain use this to your advantage, many people will run for shelter, but if you’re willing to get wet, you’ll probably notice shorter ride queues and you’ll be able to ride more. Also parks are starting to offer a rainy day guarantee so if it does rain you get a free ticket to return, but check this online first. If you’re lucky enough for hot weather, ensure you stay protected from the sun, drink lots of water, use sun cream, and wear a hat! Use the theme parks app to plan routes, see opening times, and queue times. Some apps also include discounts for food and drink deals, so make sure you check them regularly! Only carry with you what you need, this will save you having to keep handing over bags to non-riders, or ride staff whenever you ride. It’s also less stuff to weigh you down, or even worse to lose! Only take a small bag, or no bag at all if you can help it! If the park allows it, join the single rider queues where possible, this will save you bags of time as the queues are generally smaller. If you are in a group you do risk not riding together however not having to wait 90 minutes to ride means you can all get on more rides throughout the day. Arrange a central location for you to meet at the end of the day, or should one of you get lost. This is especially important if you are with kids, or a large group. Arranging a central meeting point will take away a bit of the stress if one of you does get lost! Fast pass / fast track tickets are usually very expensive, but they almost guarantee you to ride more rides. Check them out at each park and see if they seem worth it for you. Try to research in advance, so you’re not wasting valuable time on the day, debating if to get them or not. This also depends on what day you’re going, for example Tuesday – Thursday during term time queues are usually short anyway so there is no need for a fast pass. If you are travelling with children, research in advance how the theme parks child swap scheme works. They vary from park to park, so it’s always best checking, for example here is the info for Alton Towers: Parent Queue Share passes enable Parent One to queue in the usual way, ensure that the pass is punched by a ride host. Parent two meets Parent One after the ride and takes the pass to the ride host via the access point to enter the ride. This ensures that the child is not left unaccompanied and that the parents can still enjoy our attractions. If you have any other hints or tips then please share them here, and don’t forget to follow us on Instagram and Twitter! Previous Previous post: Long Weekend Away: Dog Cottage. Next Next post: Merlin Annual Pass Long Weekend.